I’ll be honest and say these are not my idea – I came across them on Pinterest when looking for fun seasonal morning tea ideas. I thought a gardening-themed snack would be perfect for Spring, when we are doing lots of planting and weeding at the moment. 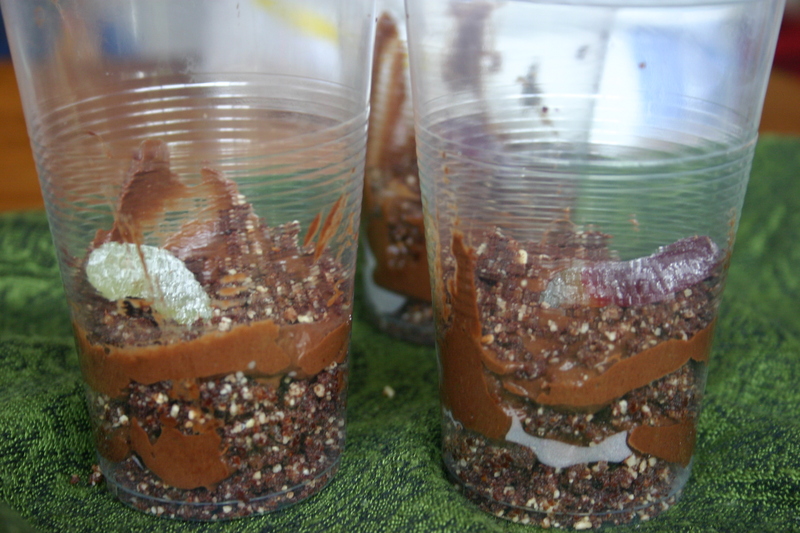 My version of Dirt Cups are free of sugar and grains (except for the lollies on top! ), they use fresh raw ingredients and are suitable for vegans too . This is what the original recipe I found looks like! There are lots of dirt cup recipes around the place. This one asked for layers of crushed up chocolate cream biscuits and packet-mix chocolate pudding, with lolly worms on top. It looked delicious – but for those of us who are sensitive to certain ingredients it also looks like a reaction waiting to happen. I know how super easy it is to prepare delicious treats that are sugar- and additive-free, so I’ve changed the recipe to include raw whole foods – except for the lollies! The lollies I found were vegan sour snakes, but they are short and stubby and look just like worms. 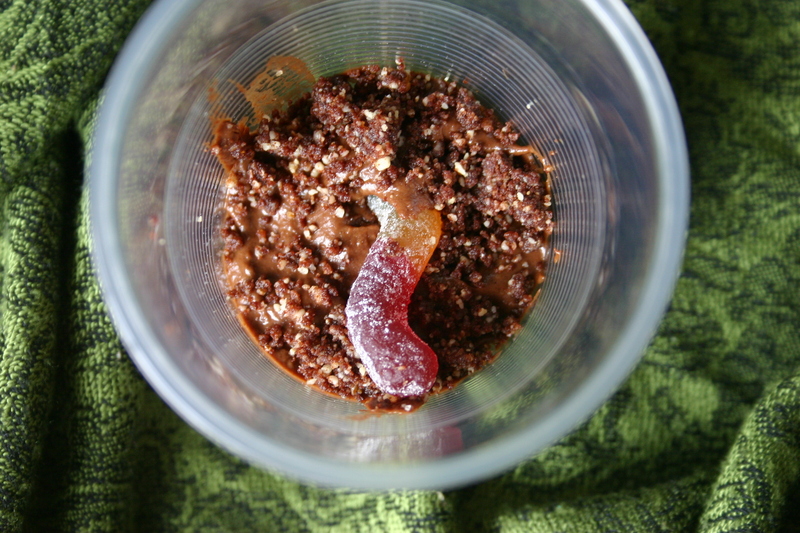 I personally do not like lollies much, and my children only ever have lollies at birthday parties, but this recipe looked like too much fun and without the sweet and interesting little worms you might as well just eat this recipe out of the bowl … but then you’ll probably do that too – we did. The Lavendilly Dirt Cups are pretty sweet, even without all the processed ingredients, and the whole thing is really rich. I made these for playgroup morning tea for people with little tummies (and their dads and mummies) so our cups had rather small portions, but we all agreed it was just enough! They are rather messy to make, and not very easy to present very neatly, particularly with small helpers, but they were pretty fun to put together and I think the whole point of it was to enjoy a bit of grubbiness, so pardon the presentation and enjoy the mess! To make up the dirt, finely ground the nuts in a food processor, then add remainder of ingredients and process until it all looks like sticky crumbs. To make the mud, process the dates, maple syrup an vanilla until smooth, then add remainder of ingredients and process again until you get a super-smooth chocolate pudding. 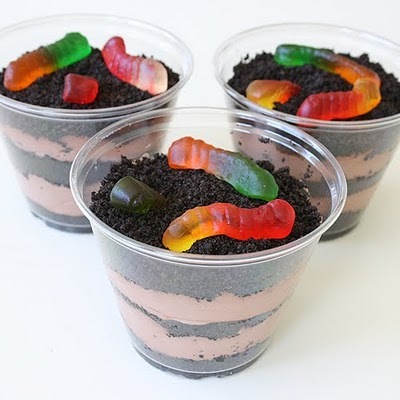 Layer the dirt and the mud in clear cups and add a few lolly worms on the top. maybe 12? I made 24 for playgroup and doubled the recipe – but we only got a little but each … although that was plenty, wasn’t it?